Front Camps East Texas Sawmill Towns. With names like Lindsey Springs, Fastrill and Alceda, they played a supporting role in the development of Texas' forest products industry between 1890 and 1940. Today, they're little more than trails or clearings in the forest. They were logging camps - the short lived and sometimes mobile communities which supported the earliest East Texas sawmills. Frequently called "front camps" because they were located at the edge of a forest, the settlements usually lasted only as long as the timber they cut. When a tract was exhausted, the camps -- housing, stores, equipment, people -- were loaded onto railroad cars or trucks and moved to another location. 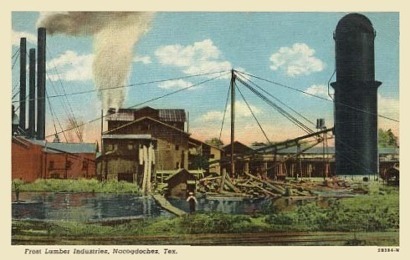 "Frost Lumber Industries, Nacogdoches, Texas"
One of the oldest logging camps, Lindsey Springs, was built by Southern Pine Lumber Company in 1897 in Angelina County on a tract of timber purchased to serve the lumber company's new mill in Diboll. The camp was built in three sections, each surrounding the natural springs which formed a creek and provided drinking water for the camp families. The town had about 110 people in 25 households, including a boarding house with 11 boarders. Professions included laborers, teamsters, saw filers, tie makers, section foremen, log contractors, foremen, commissary clerks, carpenters and a potter. While Lindsey Springs had a tram railroad to connect it with Diboll, the residents of many other logging camps in East Texas were marooned in the forest, and became reliant on each other. The camps, although rustic, did provide the necessities of life for their inhabitants, such as schools, commissary stores, churches, recreational facilities, post offices, and often a doctor. Housing, which was provided by the lumber companies, was temporary and usually consisted of small, wood-frame structures with attached porches. The buildings were often designed so they could be easily moved. One of the most famous logging camps was Fastrill, located near the Neches River in Cherokee County. Southern Pine built Fastrill in 1922. Of all the company's logging camps -- including Alceda, White City, Bluff City, Lindsey Springs, Walkerton, Neff, Huff, Gilbert, Buggerville, Gipson, and Apple Springs -- Fastrill is remembered best by the company's logging families. "It was as pretty a logging camp as a person ever went into," recalls Wesley Ashworth, a carpenter who lived there. "It had wide, long streets, sycamore trees up and down the streets, and they were really pretty. It was on a sandy hill, but it was a beautiful logging camp." Fastrill -- which lasted until 1941 -- got its name from a combination of three lumber company officials: FA from F.F Farrington, a former Diboll postmaster; STR from P.H. Strauss, who was in charge of camps or Southern Pine; and ILL from Will Hill, the company's woods foreman. The logging camps were critical to the early growth of lumber companies because they kept a steady flow of logs flowing from the forests into the sawmill towns. But as newer methods of logging and transportation became available, the logging camps began to fade from the woods. Today, they�re only a dim memory -- except to the people who lived there.